There are books no meant for Right-wingers like me, some would say. 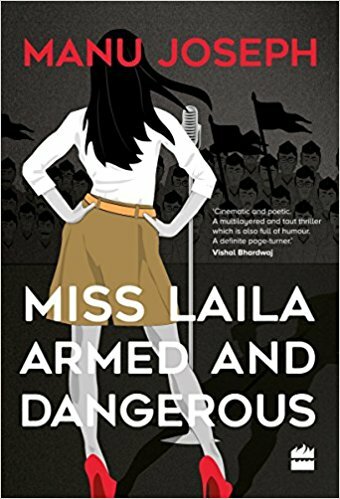 On the face of it, Miss Laila, Armed and Dangerous is one such book. But then, a question kept coming back to me again and again while I read this book- How often does it happen that you do not agree (even detest) many things the author writes but still are unable to put the book down on account of an unmitigated charm of brilliantly written words which do not let you go? "I couldn't get Modi out of my head as a literary character. This guy is meant for fiction. And not just an easy lampooning. There is complexity about him- not internally, but the perception of him. The way he is projected as a hologram of half-a-billion people, and everyone has added something of themselves to it." "How weird, between the Pope and Damodarbhai, two virgins rule half the world." "In sarcasm one says the exact opposite of what one means." This he writes, ignoring the judgment of Supreme Court of India, ignoring the fact that Army was called quickly once neighboring Congress-ruled states refused to send additional forces, and that this is probably one riot in which large number of men from majority community were killed by the Government forces trying to control the situation. I know it for I remember sitting in the outskirts of Ahmadabad, watching the Television screaming- "Riots continue in Gujarat, two injured in stabbing incident" followed by a whispering - "12 dead in a violent scuffle among two groups in Bihar". I find Mr. Joseph's sarcasm on this fifteen years later amusing, but I respect his right to write the fiction. And he is really funny when he writes it. The story is loosely based on Ishrat Jahaan encounter, in which a young Mumbai girl was found dead in a police encounter. Police claimed the girl to be a part of dreaded Islamist terror group, Lashkar-e-Taiba (this was immediately owned by the terror-group website), while the media, co-opted by the Congress, which was then in power, went hammer and tongs after Narendra Modi, the then Gujarat Chief Minister, to arrest his ascent on the national scene; claiming Ishrat to be innocent, encounter to be staged. No one could explain the presence of a Mumbai girl in Gujarat, or the immediate appearance of condolence on the terror organization's website. No one bothered as Congress was in rule and was the dynasty was supposed to continue forever. Once the power changed hands, the cookie started crumbling, witnesses from Central intelligence started coming forward explaining statements taken under duress to frame Modi,the formidable, elusive and omnipresent Damodarbhai of Manu Joseph. Ishrat is Miss Laila, who Mr. Joseph insists on presenting as wronged girl. I suppose, we must grant him that on account of his journalistic antecedents. And we know that Akhila Iyer is none other than Manu Joseph. Manu takes us to the childhood of Akhila and explains the failure of Communism form a child's innocent eyes which selfish grown-up eyes miss. He writes about Akhila's dad's brief brush with militant communist (is there other kind?). ...When the police captured tham and started massaging their balls, they called their papas, who couriered the bribes, and that was pretty much the end of their revolution. They surrendered to the new money and made it more money. The girl begins to read about Mr Mao. In the first five minutes she is excited. He is dead. Mother's boss has been long dead. She runs to Father and says,'Does Ma know?' Mother knows. The girl is confused, dejected. She had thought if the news of Mr Mao's death is broken to Ma, she might shut shop and return. But Ma knows. She works for a dead Chinese man. Right. The girl reads more about Mr Mao. She is even more confused. She figures that Mr Mao actually wanted farmers, at least most of them, to become factory workers. And he took away so much of grain from the farmers in China that millions of them starved to death. He seemed to have been a very cruel man. She runs to Pa.
We won't find many adults having the understanding which dawns on Akhila in the above paragraphs. We also won't find many Right-wing writers writing that splendidly about Communism and its failures. That is why I love Akhila and Manu Joseph. They don't hate only the Right (though, I could not find the Cow vigilante chapter adding anything to the value of the story, wonder if Rajdeep Sardesai stole Manu Joseph's manuscript and sneaked a chapter in), he hates and mocks left as well. That makes him an equal-opportunity hater and that makes this book a great read. Besides Manu Joseph is brilliant with his words. My recommendation: Put your prejudices aside, as a rightist and leftist, and Do read. And also because, Right Wing is not a cabal which gangs up to gag dissenting voice. While Manu Joseph obliquely indicates some sort of curbing of freedom with the coming into power of Damodarbhai, or Narendra Modi, the fact that the book was written, published and is well-marketed all across, demonstrates that the narrative of right-wing fascism is nothing but fake; and the fact that a right-wing writer reads it, likes it and reviews it, breaks the myth of right-wing intolerance.